Anytime our grandson comes, the dogs become glued to him. They play and play, and then they all pass out together. I like to say they are guarding him, which is probably the truth. My grandson is 11 now, and his name is Ashten. The tan dog you see in the picture is Boo, and he is 6 years old. The white dog is our miracle rescue dog, Abby. She’s about 3 years old. They love to play ball, swim, run, wonder through the woods and just be together with our grandson. When he’s here, we never have to worry about him – he has his angels with him. Pit bulls are such awesome dogs, and whether people believe it or not, they’re wonderful with children! 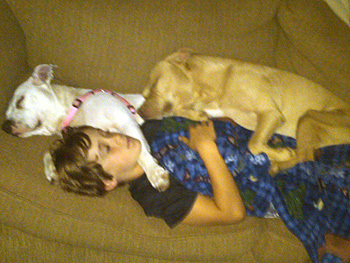 Pit bulls are magnetically drawn to kids. 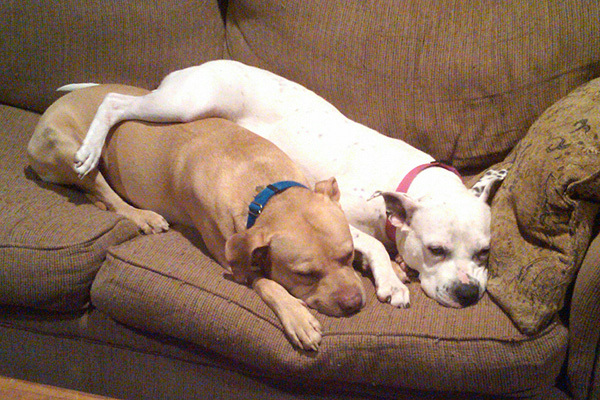 Pit bulls also seem to see humans of all ages as great pillows! The last picture says it all! Oh my dear. That is so freakin’ adorable. They are all literally laying on top of each other. I’ve been staring at it trying to figure out who laid down first…lol. Looks super cozy! @ReganWoodPhotography. That’s a couch full of cute! @Matt.S Haha, it is hard to tell who got on the couch first, but Matt is right, it is a couch full of cute!